A user-friendly Game Maker: Studio platformer engine with a focus on ponies. We've all seen it done. We've all seen platformer engines. We've all seen the countless amounts of square characters standing on boxes. But there seems to be a lack of platformer engines that are beginner friendly, or better yet, are focused on some specific style of game. This is where PONES comes in. 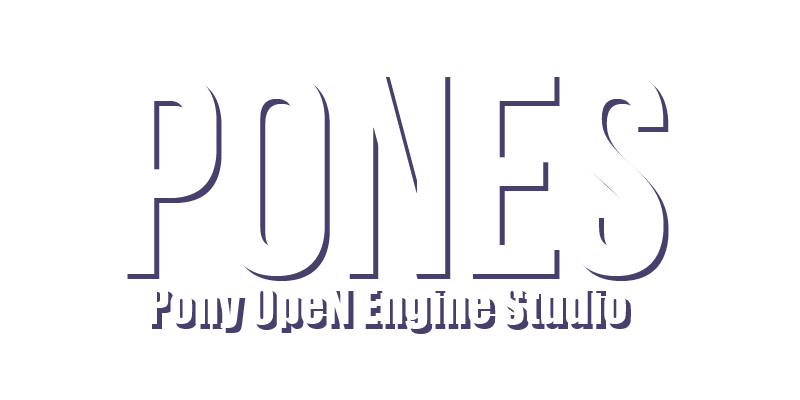 PONES is an engine for Game Maker: Studio that focuses on allowing someone who knows the basics of Game Maker to make their own pony fangame. But it's not just limited to pony games, and veterans of Game Maker can pick up and use this engine with ease. Nearly everything that a developer needs to get started is in the create event of the objects. The engine is rather small, and doesn't include much, but since you've got all the essential basic platformer needs out of the way, you can focus more on the level design, art, enemies, story, etc. All of the credit information is inside of "help.rtf" or in the "Game Information" in the Game Maker resource tree. This is the result of less than 24 hours of work, so there may be things that aren't commented very well or some features I may need to change a bit in order to make them a little more user-friendly. If something is not commented enough, or you have any questions, please ask them here, or directly to me via my Twitter. Neat. Have to check it out sometime since I already have a GameMaker: Studio license. I'd argue that Game maker already is the engine and you created an architecture or framework on top of it. Looks snazzy nonetheless though! Big ups! (09-08-2016, 12:01 AM)Lex Rudera Wrote: I'd argue that Game maker already is the engine and you created an architecture or framework on top of it. Looks snazzy nonetheless though! Big ups! Of course, but it's no different from say Love2D or Construct in that regard. A leg up is still a leg up. (09-07-2016, 11:14 PM)Stormy Wrote: Neat. Have to check it out sometime since I already have a GameMaker: Studio license. Funny thing is that I just bought that today! That being said, here's an HTML5/WebGL version of the example game! I have to say I would definitely love to switch to this engine with some of my projects, I'm ashamed to say while I have used Game Maker for years I've never learned how to properly do slopes, despite taking multiple tutorials on how, sure I can make them but they are very limited (and possibly broken.) compared to yours. Physics have never been my forte in game maker to say the least. If I can manage it, I do have a short Hearth's Warming Eve/Christmas themed game planned, this engine will help so much with that. I may even be able to finish the game before Christmas. Wow I'm glad I found this. Slopes are super smooth. I am already working this into my project. Question: What would be the best way to slow the movement down when moving up a slope? (12-10-2016, 12:58 PM)spacerobot Wrote: Wow I'm glad I found this. Slopes are super smooth. I am already working this into my project. The engine needs to know if the character is on a slope, so you just need to see if you can use that checking yourself, the check if the character is going up (vspeed negative or something) and slow it down. Thanks I got it based on your info. I set an onslope variable then if that was true I set my x += to hSpeed * slopeslow. I appreciate the help.